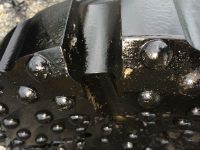 We supply a wide range of Drill Bits for Open Hole DTH Hammers for the installation of Open Hole Drilled Mini Piles. Mini Piling Plant Hire stock a wide range of Drill Bits, DTH Hammers, Shock Absorbers, drill rods, spanners and drive subs for delivery or collection nationwide. For installing Open Hole Drilled Mini Piles. Open Hole Drilled Mini Piles are used when underground obstructions such as rocks, boulders and mass concrete are expected, but conditions will allow the pile bore to stay open without support, to penetrate hard strata to form a pile, or rock socket into a rock layer or bedrock. The Drill Bit is the cutting face that attaches to the end of a Down The Hole Hammer. A DTH Hammer is a pneumatically operated, self contained recipricating hammer designed to be screwed on the bottom of a drill string. Powered by high volume air compressor, the fast hammer action breaks hard rock into small flakes and dust and is blown clear by the air exhaust from the DTH hammer. DTH Drilling is one of the fastest ways to drill into hard rock. Drilled Mini Piles are installed by drilling into the ground with a the DTH hammer and drill bit to a specified depth. Once the drilling string is retracted from the bored hole it is filled with grout or concrete and a single bar or reinforcing cage is inserted. At Mini Piling Plant Hire we also supply a broad range of DTH Drilling Rigs suitable for all types of project and any required accessories at extremely competitive hire rates throughout the UK.